Jesus said, “And I have other sheep that are not of this fold. I must bring them also, and they will listen to my voice. So there will be one flock, one shepherd” (John 10:16). The South Dakota District engages in mission work on two South Dakota Native American Indian Reservations: Rosebud and Pine Ridge. Here you can learn more about the mission and ministry of our District’s Native American Ministry. Rev. Andrew Utecht is a faithful servant of the Lord who serves the people of the Rosebud Indian Reservation. He shares the Gospel of the Savior Jesus Christ, offers Biblical counsel, and performs acts of mercy and care in Rosebud and Parmalee. He is involved in a sewing factory that provides jobs to Native Americans sewing Native American Star Quilts and other products. 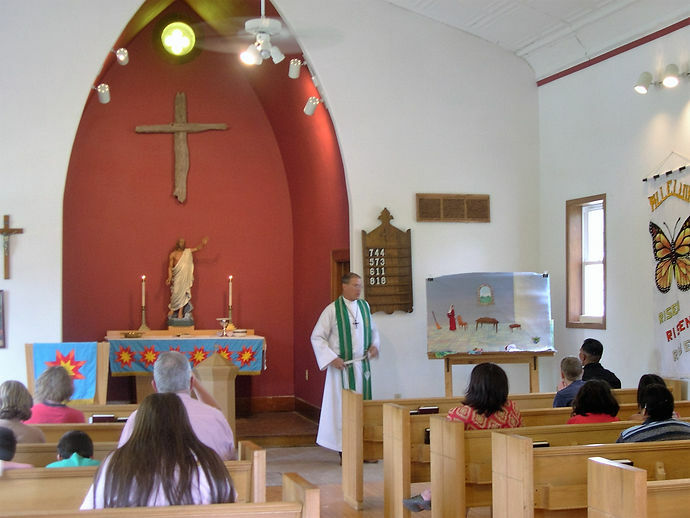 You can learn more about Pator Utecht's mission among the Native Americans at the Rosebud Lutheran Church and Lord's Warriors Lutheran Church, Parmelee website. Rev. Albert Sutton faithfully serves the people of the Pine Ridge Indian Reservation. He shares the Gospel of the Savior Jesus Christ, offers Biblical counsel, and performs acts of mercy and care in the Evergreen housing development near Porcupine on the Pine Ridge Indian Reservation. He serves alongside his ministry team: Larry and Doris Belitz and Jeff and Diane Falin.